The agreement with your plumbing contractor could call for either of you to provide the plumbing fixtures (fixtures are defined as anything you touch that turns water on or off). I recommend that the plumber provide the fixtures. Shop for what you want, and then give the plumber a list with the brand names, model numbers, and colors of everything you have chosen. You should have all of this included in his contract price, for him to provide. That means that if any part of anything he provides is defective, he will be responsible for replacing it. Conversely, if you purchase the fixture yourself and provide it to the plumber for him to install, he cannot take responsibility for any defect. It would be your task to provide a new fixture and pay again for the labor to replace it. ● All parts and connections needed to install everything into finished, operating mode. As for the items you are selecting, any full-service building supply store should have everything you need for a one-stop process. You should provide the dishwasher as part of the appliance package you’ll purchase. 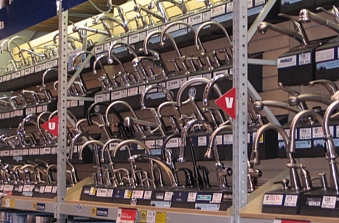 Also consider plumbing specialty stores for an even better selection.